I bought my first houseplant last year. I’ve never been good with plants: when I was a child, my grandmother gave them to me as gifts and inevitably I would over- or under-water them. This one is, I believe, a pothos, which is good, as many websites devoted to plant care tell me the pothos is a species that thrives in the homes of the kind of people who forget to water their plants. Like me. I am already fretting over it: I watered it once last week, I have watered it once this week, and I will water it again next week, but in the meantime, is it getting enough light? Too little? Should I bring it outdoors with me in the morning? Would my plant like to go on a walk, or listen to music? Is it tired of the same jazz album that I’ve been playing on repeat for the past four days? Maybe it would prefer some Carly Rae Jepsen, or a little David Bowie. What kind of music do plants like? I know there are studies on this, somewhere. Michael Marder calls plant ontology “the zone of absolute obscurity.” This phrase seems self-evident in a way that philosophy so rarely is, a basic precept that I find comforting even as I know that calling it “self-evident” is overly simplistic. But the point stands: we can’t ever know what it’s like to be a plant; furthermore, the massive biodiversity of the plant world (like any other kingdom) means that even if we knew what it was like to be a certain kind of plant — my pothos, say — there are millions, billions yet to be understood or known. 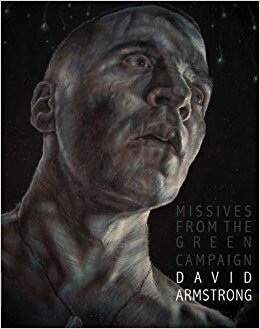 But this is already straying from the topic of this review, which is David Armstrong’s Missives from the Green Campaign, a fabulist work about war and climate change and not about what it is like to be a plant at all. But it is a story about what it means to care for green things, for living things, for people. The Green Campaign of the title is a military one: an environmental war in which soldiers are tasked to carry and care for potted plants. “We no longer fight wars of desecration, but of preservation,” goes one of the many strictures given to the soldiers. Yet (as with so much embedded tradition) the aims of the soldiers’ tasks — not to mention of the war — are unclear, but the stakes of plant care are serious indeed. It is treason, punishable by death, to harm a plant: this includes direct harm, but also letting one’s plant wither and die. The refrain of the soldiers’ catechism — “This you will learn. This you will know” — is self-consciously religious. The stricture to care for the plants is not quite an exercise in futility, but is certainly more performative than anything else: the plants of executed soldiers, after all, are placed in the ground and left to thrive or die as they will. Neither recycled back into the green room where new soldiers are inducted into plant care, nor composted into mulch that could return growth for growth, the plants, like the executed soldiers, become mere waste, their deaths neither commented upon nor mourned. The narrator of Armstrong’s book gives what he is told, to the detriment of his health and his reputation and ultimately, perhaps, his life: cares for his peace lily and for his squadmate Hershel Boyd, both creatures which seem too fragile to survive but thrive in response to what the narrator gives. But in giving what he is told, the narrator gives more than the bare minimum expected and becomes an object of suspicion even as his health deteriorates. The soldiers are told that they fight a war of preservation; the narrator, in contrast, nurtures those around him, but in doing so becomes a sacrifice himself. Missives from the Green Campaign is made up of absences; some of these are eventually filled but many more remain void. The “missives” are excerpts from the narrator’s official file, including redacted, partially redacted, and missing pieces. The numbers don’t add up, of course: there are gaps, wide expanses of nothing that offer the suggestion of other voices and other explanations. The hidden apocrypha to the soldiers’ neophyte catechism. And still, the novel ends in the future tense, in the suggestion that something, somehow, might turn out differently than we expect, with the suggestion that care for another being might result in care — or at least forgiveness — for oneself. Pothos is a plant known for the variegation of its leaves; a fully green pothos, I am told, is not a healthy plant. I have moved my pothos away from the window but still within reach of filtered light. I had to take a knife to one of its stems; the whole thing seemed to be rotting and drying simultaneously. Since I have done that a profusion of leaves has burst from the middle of the plant, unfurling in glorious yellow-green curls. Love and pain; death and growth. Dolor hic tibi proderit olim. Clichéd, perhaps, but literal; the question of pain is always a looming one. What does it mean to care for a houseplant? Unlike a pet, a houseplant does not even make a show of loving you back; unlike throw pillows or paperweights, a houseplant is a living thing and more than mere decoration. Some plants filter the air, we are told; care for these plants, nurture them, and they will contribute to the health of your household. We exchange small gods for growing things, and are content.